BANGI, 3 November 2014 – The experience of meeting some students from the University of Malaya Singapore had sparked a determination in former Director of the Institute of Malay World and Civilization (ATMA) Professor Dato’ Dr Wan Hashim Wan Teh, to become a somebody. Prof Wan Hashim, 65, said he had also wanted to be a member of parliament. Thus was his “brief” story, delivered with enthusiasm after being awarded Professor Emeritus at the 5th session of the 42nd convocation of The National University of Malaysia (UKM). He said when he was a boy he met up with some student friends of his elder brother who were with the University of Malaya, Singapore. They were to become government and corporate leaders of the future, like Tun Ahmad Sarji Abdul Hamid, Dato’ Zainal Abidin Salleh, Tan Sri Mohd Yusuf Hitam and the late Jamsari Mohamad. He was impressed that a group of students from Singapore wanted to visit his hometown of Gerik in Perak. “They were so cool. That was what I wanted, to look smart like them,” he said. Prof Wan Hashim said he also dreamt of meeting Bollywood movie stars because he was a fan of Hindustani films. As a child, his ambition was to become a district officer or a singer or film director. He also loved to play the piano and guitar when he was at Clifford Secondary School in Kuala Kangsar. What he did not expect was to become a scholar or an academic. Accordingly, the dream of going to university became a reality when he enrolled at Monash University in Australia, where his course in life changed. Returning home, he began his career at UKM but the temptation to flirt with politics was too strong. He finally gave in to requests from politician friends to be a candidate for elections after 30 years as an academic. There were those among his colleagues at UKM who said he crazy for standing in the general elections. He does not regret whatever decisions he made throughout his career – even the bitter experiences were good lessons to him. Prof Wan Hashim has so far authored and edited 42 books, including materials under the auspices of the Council of the Malay Rulers. 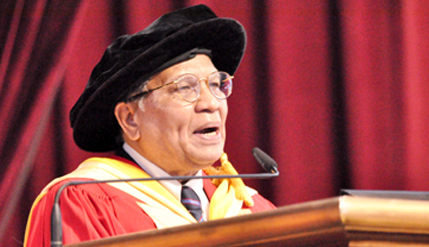 Presently Prof Wan Hashim is on the board of several educational institutions.